Though I live in Michigan far away from Sandy’s path of destruction, the wake of devastation she left behind has impacted many of my family and friends. I’m Jersey, born and bred. My parents — who live in northern N.J. in the mountains where it’s really cold this time of year — were fortunate to not have trees fall on their home (as happened to lots of people I know) … but they were without power for several days. My two best friends from high school were stranded in power-less, flooded Hoboken. Everyone is OK … but the images are just terrible. Fortunately my sister — who lives in NYC — was out here visiting before Sandy and though she was supposed to have left last Sunday, she’s been here ever since because first two flights were canceled. (She’s scheduled to fly out early tomorrow morning). I see the images on Facebook and Twitter, on the news, online articles … and while it all just seems awful and overwhelming, what has made me most sad has been the images of the boardwalk at Seaside Heights. This video sums up the destruction pretty well. It’s terrible. Yes, we will rebuild — and there have been lots of grassroots efforts already started, lots of people stepping up to help out in whatever capacity they can … but I’m here in Michigan, so far removed from it and can’t help but feel helpless. I hate seeing my hometown in ruins, I hate seeing the streets and subways flooded, I hate seeing families without heat and food and water. But these images of the Jersey shore in ruins really hit me most of all. Like so many, I have fond memories of summers down the shore. Spending the day jumping waves with my dad and then walking on the boardwalk at Seaside Heights, eating giant slices of pizza and playing arcade games (I was good at skeetball) and mustering up the courage for all the rides overlooking the ocean … salt spray on my face, seagulls squawking in delight … wonderful memories. Which is why seeing the boardwalk in shambles hurts so much. The photos of the roller coaster submerged sting. It’s like a piece of my childhood drowned — and it doesn’t even directly affect me. My heart aches for those small business owners whose shops have been ruined, all the people whose homes have been destroyed … it’s just terrible. 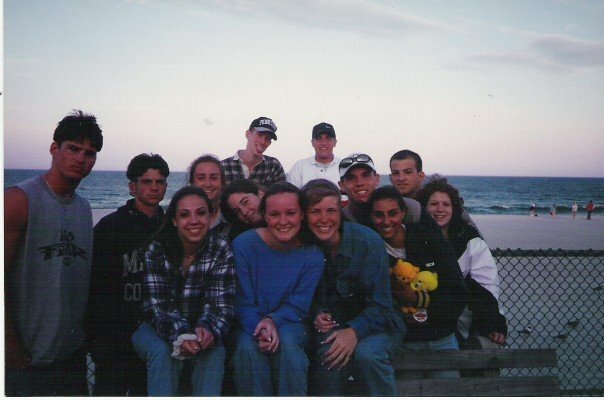 I was trying to remember the last time I was at Seaside Heights and it would have been senior prom weekend — June 1997. This is me and my best friends. I’m in the white jacket on the far right. We were so young then … and it was our first big overnight away, all of us — a BIG deal. We stayed at the beach house of one of my best friends in Seaside Park and spent some time on the boardwalk at Seaside Heights. We were probably an odd group in that we didn’t drink in high school — and even prom weekend, we didn’t drink. We just spent a lot of time talking and laughing. When I went to college and would tell people about my high school group, I got looks like, “REALLY? You guys didn’t drink? No one?” They were shocked. It wasn’t that we were goody-goodies; I just think the thought didn’t cross our minds. But that weekend was seriously SO fun, and a great way to end high school. I’ve been to the shore since, but usually to Spring Lake, which has a much different vibe than Seaside. There’s just something awesome about the shore that even Snooki and her gang can’t taint. Of all the stereotypes out there about New Yorkers and people from Jersey, this one rings true: we’re tough and resilient. We’ll build again. We’ll move on. It’s just sad this happened at all. How about you? Were you or your family affected by Hurricane Sandy? i thought a couple times and didn’t ask you when i saw you about your mom and dad (i’m so sorry about that!). you’ve endured some pretty major disasters … mine have only been personal for the most part. i haven’t dealt with devastation from storms (or even terrorism). for that i feel fortunate, but my heart does break for all of those impacted. LOL, thanks–we were babies there, just 17! Thanks!